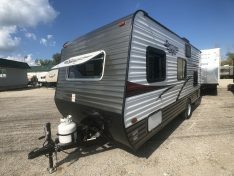 The Sportsmen Classic line of small compact campers from KZ manufacturing offer all of the amenities that you will find in a larger RV but in a lighter smaller RV. 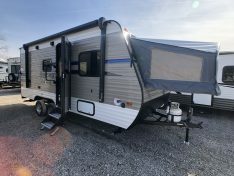 The Sportsmen Classic line of travel trailers by KZ provide 78″ of interior height, LED lighting, large convertible dinette’s, plush pile bunk and bed mats and comfortable seating throughout. The kitchens boast a large amount of storage and include a deep bowl kitchen sink that’s large enough to fill pots, pans and pitchers. 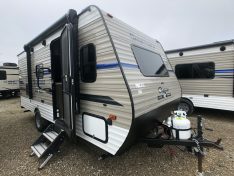 With Air Conditioning, Lighted Power Awnings, and a host of other convenient options available, this small RV packs a large punch. 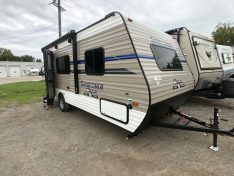 Ranging in lighter dry weights from 2100lbs to 2840lbs makes towing this small camper a breeze.